Mike Colligan and Josh Yohe were nice enough to take some time out of their busy schedules leading up to the Pens opening first-round series with Columbus to give us a glimpse into their crystal balls of what will be the keys for the Pens this series, and who they predict will be drinking from Lord Stanley come this time in June. We would love to hear your comments with your own predictions for any of the topics mentioned. Enjoy and Let's Go Pens! Pens Initiative: What are your first-round predictions for each series and why? Mike Colligan: Colorado vs Minnesota: Colorado in 5. The Avs could struggle without a healthy Matt Duchene, but they got an ideal matchup in Minnesota. Semyon Varlamov should be a serious contender for MVP this season. St. Louis vs Chicago: Chicago in 7. What a freefall for the Blues. I wouldn't have been concerned for them until a number of players got knocked out with injuries. Chicago is just too deep and too experienced. Anaheim vs Dallas: Dallas in 7. Dallas is a sneaky team. If they don't pull off the upset this year, they'll be in position to do it next year. Kari Lehtonen will be the key in goal. The Ducks are very good, but not as good as their record indicates. Perry and Getzlaf will have to really focus on shutting down the Benn-Seguin line. San Jose vs LA: San Jose in 7. Games between these two teams are always enjoyable to watch. This series is a toss-up, with the winner likely advancing to the Cup Finals. It's time for the Sharks to finally break through. Boston vs Detroit: Detroit in 6. Boston is the elite team in the East, but Detroit was the one team they didn't want to face. The Red Wings match up perfectly against them and a Henrik Zetterberg return would be huge. Tampa vs Montreal: Montreal in 4. The Canadiens are playing great hockey at the right time. They're flying under the radar in the East. The addition of Thomas Vanek has balanced out their lines nicely. NY Rangers vs Philadelphia: New York in 6. The Rangers haven't been able to get Martin St. Louis going but they're still a tough team to beat. The Flyers are capable of beating any team in the league one night, and the next night they lose 7-1. This series could also go either way, and both teams will likely wear each other down. PI: Who are your Eastern Conference Champ/Western Conference Champ and why? Colligan: If the Bruins survive against Detroit, they'll probably represent the East. Too deep, too good, incredible goaltender, and totally built for playoff hockey. In the West, this has to be the year for the Sharks. They get so much criticism, but they've always got a great team in Cup contention. They're faster than they've ever been, but of course it won't be easy surviving that Western Conference gauntlet. Simply put, the Bruins are the safe pick. Every other team in the Eastern Conference possesses a significant weakness. The Bruins do not. The Penguins’ bottom-six is a real problem and makes a matchup with the Bruins a bad thing. Montreal is interesting but is a small team, and small teams rarely make it to the Stanley Cup Final. On paper, the Rangers are interesting and Tampa Bay is certainly a team on the rise. Detroit is a scary matchup for the Bruins, but does not strike me as a Stanley Cup Final team. Boston most certainly does. I am basing this simply on the eye test. After covering the Penguins game in San Jose last month, I decided at that moment that the Sharks were the best team in the Western Conference. Is this really the case? We’ll see. I love this team’s roster. They’re great down the middle with the likes of Joe Thornton and Joe Pavelski, they can score – Logan Couture and Patrick Marleau, for starters – and they’re enormous, with the likes of Brent Burns being built to play in the playoffs. Yeah, it’s the Sharks, and they always choke. I know. I get it. That’s what people used to say about the Red Sox, too. Eventually talent wins out. The Sharks were the biggest and fastest team I saw all season. In a Western Conference that is remarkable, I like them to emerge. Chicago, St. Louis and Anaheim suddenly look a little flawed. Sharks/Kings winner will come out of the West. 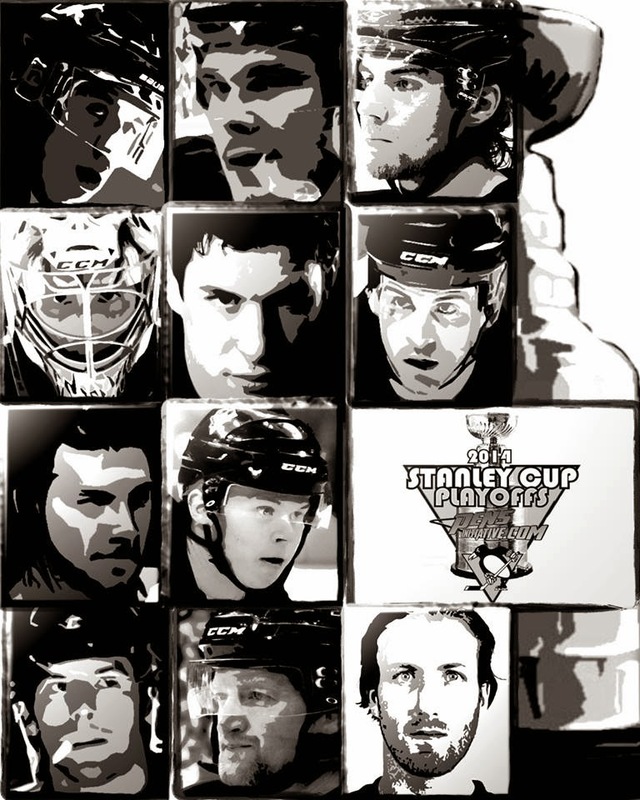 PI: Who is your Stanley Cup Champion? Colligan: San Jose, for all the reasons above. I think Boston is a great team. I also think a lot of key Bruins are aging and that they can be had. Joe Thornton gets his revenge. PI: What are the keys to the Penguins first-round matchup with the Blue Jackets? Colligan: Pittsburgh needs to jump on the Jackets early and never let up. This series reminds me of the Tampa series a few years ago. The Blue Jackets are coming in with no playoff experience, but they're feisty and dangerous. If they can grab a few wins on home ice, they might generate the confidence they need to pull the monumental upset. Columbus is feisty, physical, relentless, and they have great goaltending. This team is only going to get better. Yohe: The biggest key is the guy wearing No. 71 for the Penguins. If Evgeni Malkin is healthy – and after watching him the past two days in practice, I can say that he unquestionably is – then the Penguins could bury the Jackets early. Another key to focus on – other than the obvious, Marc-Andre Fleury – is the Penguins’ penalty killing. It has been weak for about two months now. Columbus won’t pose a huge five-on-five threat. Cheap power play goals have a way of evening games and series. PI: What are the strengths of this team over teams in years past? Colligan: The powerplay. With so much talent, it was always hard to believe that the Penguins didn't lead the league in this department every single year. They've finally started clicking and it's because they've become less predictable. They still run a lot of set plays, but there's more room for improvisation and the puck movement is far better than previous years. Yohe: The Penguins’ blue line is significantly better this season. Mark Eaton wasn’t good anymore, but was putting up strong plus-minus numbers because he was playing with Kris Letang. Simon Despres was being Simon Despres last season, which is to say he wasn’t particularly reliable. Letang is healthy and, while Rob Scuderi didn’t have a good regular season, he has been good in recent games. Those two will be fine together. Paul Martin is playing outstanding hockey and Brooks Orpik has been terrific since the Olympic break. So, that makes Matt Niskanen and Olli Maatta your third parting. That is a Stanley Cup caliber blue line on paper. PI: How about some of the areas where they are clearly weaker? Colligan: Cycling in the offensive zone. Thinking back to the Penguins teams that featured Jordan Staal, I can remember when the checking lines would establish offensive zone time for long stretches and wear opponents out. That rarely happens anymore. It's often one chance off the rush and then back the other way. This could be a big problem as the Penguins move on to the later rounds against deep teams. Yohe: Two things come to mind. Obviously the third line has taken a step back with the likes of Matt Cooke, Brenden Morrow and Tyler Kennedy playing elsewhere. The addition of Lee Stempniak helps, but this bottom-six in general is a problem. They aren’t overly physical, they don’t possess the puck for long stretches, they don’t excel defensively and they certainly don’t score. It’s a huge problem. Also, this version of Tomas Vokoun and rookie Jeff Zatkoff represent a huge drop from last season’s version of Vokoun. Fleury must be great all spring. PI: Aside from your personal predictions, how far can this team really go in the playoffs? Colligan: They're not in the Top 5 teams in the league, but they can totally win a Cup. The East is wide open, they've got a great matchup in the first round, and the Western teams will beat each other up. Yohe: The Penguins are one of seven or eight teams that can win the Stanley Cup. Of course they can. Although I’m not picking them to win it all – I picked them the past two springs, and I was wrong on each occasion – I wouldn’t be the least bit surprised if there is a parade in downtown Pittsburgh in June. Sidney Crosby is healthier than he has been in any postseason since 2009. Evgeni Malkin is very healthy and very motivated after what happened in Sochi. Those two can carry the Penguins very, very far. Also, Marc-Andre Fleury’s mindset is in a good place right now. He possesses a confidence about him that I haven’t sensed before. I do believe he is ready for this. I’m not picking them to beat Boston, but certainly they can. Anything short of a trip to the Final Four would be a colossal disappointment. Injuries have played a role this season, certainly, but the fact is, this team is healthy right now and remains potent. PI: Finally, for the Penguins to win the Stanley Cup _______ HAS to happen. Colligan: Marc-Andre Fleury has to be above average. The Penguins have some holes on defense and already are spending more time than usual in their own zone. Fleury doesn't have to win a series by himself, but the Penguins can't afford to have him lose a series too. The funny thing is, we won't have any idea how Fleury will respond until he's faced with that first moment of adversity. But that's what makes playoff hockey so enjoyable. You have no idea how the bracket will evolve. One mistake could mean a first round loss. One lucky bounce could mean a trip to the Finals. Yohe: There must me a complete team commitment to team defense. Sure, Crosby and Malkin – and the rest of the offense – failed against Boston last season. But I’ll always put my money on those guys scoring. The Penguins have allowed 3.17 goals per game in 41 playoff games since winning the Stanley Cup in 2009. That’s a ridiculous number and can’t all be attributed to the goaltender. Team defense wins and, on paper, the Penguins can be a very good defensive team. Trust in Crosby. Trust in Malkin. Trust in Fleury. And above all, be committed to playing defense. If they do that, the Penguins have a real chance.